60mm or 3" diameter Gray Rubber Dinette Chair Caster set of 4. 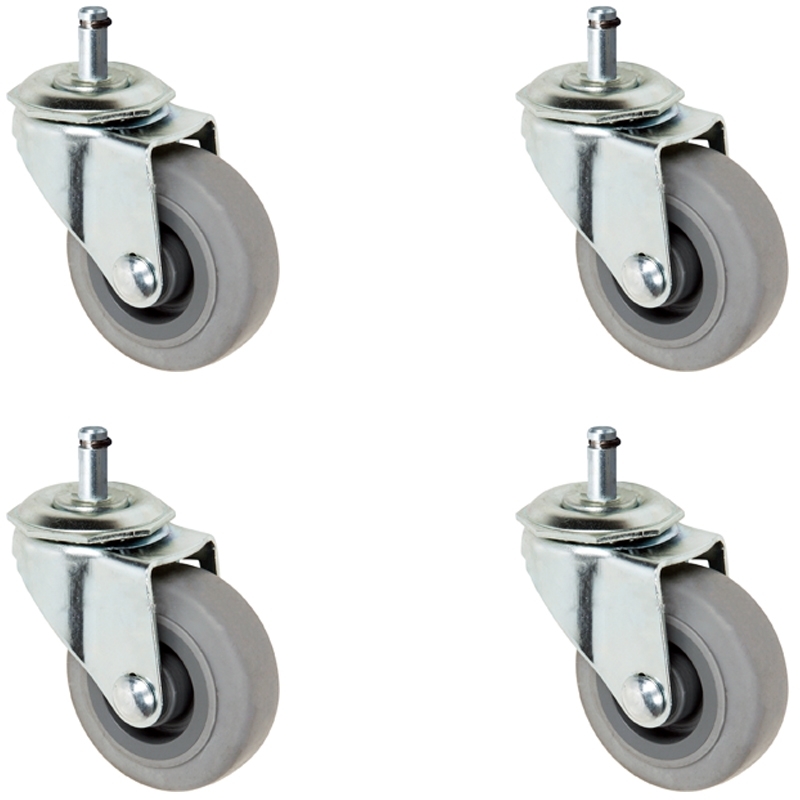 These casters are made to replace chair casters but can also be used on Dinette Chairs, Office Chairs, Home and Office Equipment, Furniture, and Store Display Stand Fixtures. This listing is for one (4) pieces of our 3" Gray Rubber Dinette Chair Casters. These casters are made to replace Dinette chair casters but can also be used on Office Chairs, Home and Office Equipment, Furniture, and Store Display Stand Fixtures. The Gray Thermo Plastic Rubber Non Marring Wheels are easy rolling and protect all floors including wood, vinyl, tile, carpet, cement, and more. The load capacity per Chair Caster is 100 lbs each meaning that a complete set of our Upgraded Gray Rubber 4 Dinette Chair casters can support weight up to 400 lbs if your chair is able to support that much weight. You will need to check your chairs manual or specifications to see if the chair is capable of handling this much weight. Use the capacity of the chair or casters depending on which item can handle less weight to be safe. Grip Ring stem casters are extremely easy to remove and install on your chairs. Simply remove the old chair casters by pulling, popping, or prying the old ones out. Usually a good pull and the casters should pop out. To install, simple press in the grip ring stem directly into the hole until the casters sit flush on the base of the casters raceway or bottom of stem.